And here’s the after! C’mon, let’s take a tour! One of the biggest requests my mom had was a large dining table. Her old white set was falling apart and only had 4 chairs. Yeah, time to upgrade. 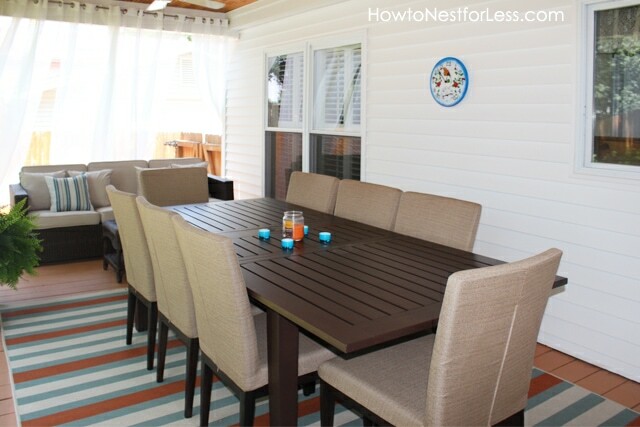 She spotted this large extension table from Pottery Barn and it’s AMAZING! 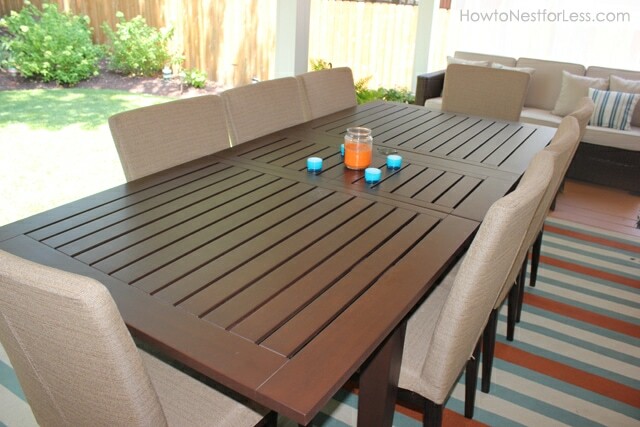 It’s called the Chesapeake Rectangular Extending Dining Table. It stretches 104 inches long and comfortably fits 8 chairs. It’s also super easy to extend (which stows underneath when unused). 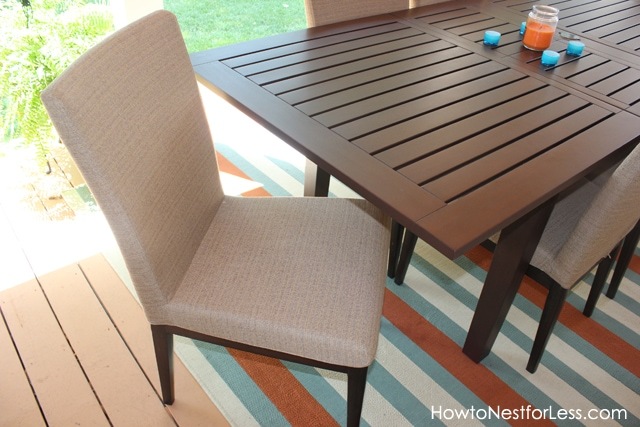 The chairs we found at Lowe’s for $100 per pair. And I’m in LOVE with this rug! We found it at Home Decorators Collection. 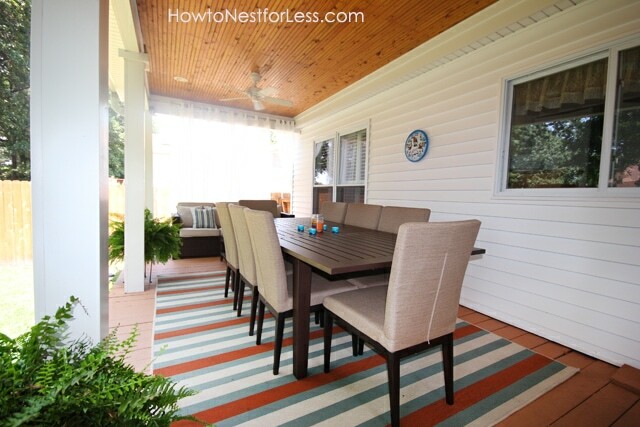 The stain on her deck is pretty orange but this rug compliments it perfectly. 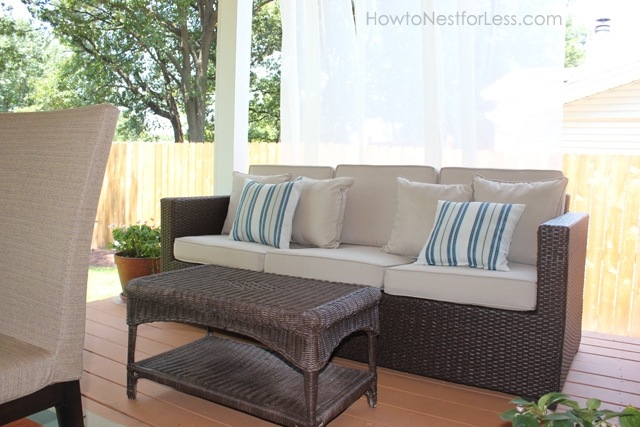 We also replaced the old white wicker loveseat with a larger resin wicker couch from Target. And the coffee table? It’s actually the old one she had on her back deck, just spray painted brown! The accent pillows are from Target. 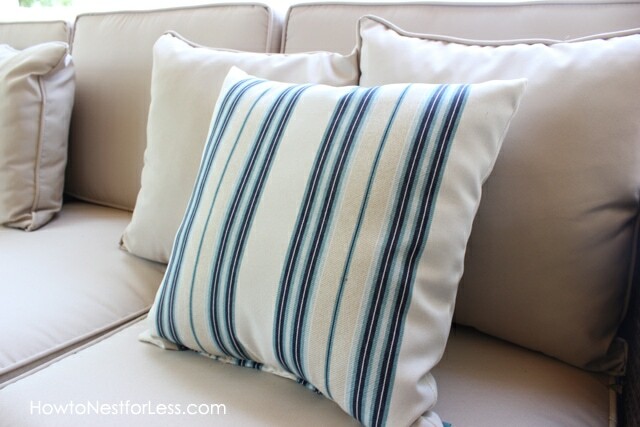 It’s nice that they aren’t matchy-matchy to the area rug, but still bring in a pop of blue to the space. 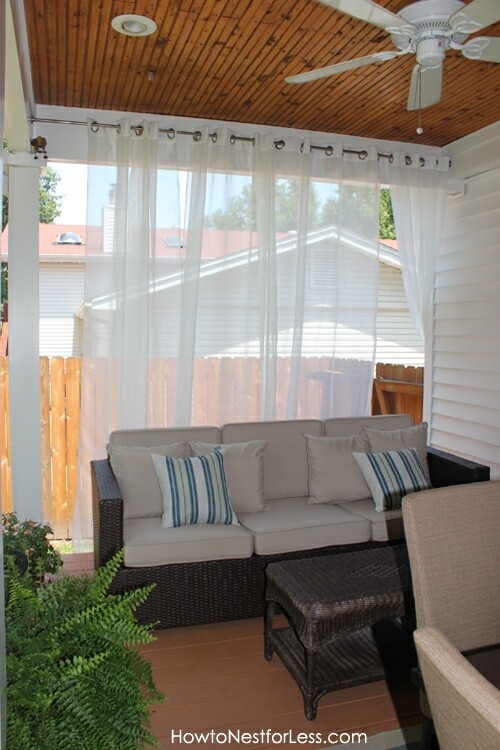 And one of my favorite parts… the new outdoor drapes! These were also purchased from Pottery Barn and add just enough shade from the direct sunlight in the late afternoon. YEAH, SO MUCH BETTER IN MY OPINION! Love it! I’d never go inside (unless for the AC) if I had a space like that! I love this space. I keep wishing for new outdoor furniture. Beautiful space love how cool and airy it looks now with your facelift and I love the rug it’s perfect! That’s amazing! Wow huge transformation. I wish I knew how to do something like that, I only dream about it. Ahhh, looks AMAZING!!!!!!!!!! 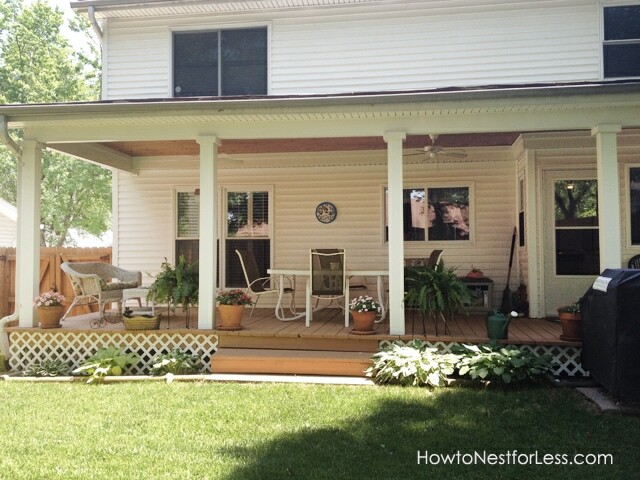 I miss that porch:) Lots of good memories there:) Love you! This is down right beautiful. Thanks for sharing. Love it! Looks so fresh! That looks really good. I wish I had a porch like that! I love the curtains and how the table was painted to match. Love the chairs and the long table. The couch looks like a place to stay for awhile! Your “after” is such a bright, modern feeling space with great energy for friendly gatherings. And it seems much more functional for the family needs with the larger table and full size sofa for naps or catching up on things. The sheer curtain provides a great sense of enclosure and privacy without making the space feel dark or closed in. I really like it. THanks so much Robin! We’ve really been enjoying the new space!! My first time to visit you and it really make me happy to find you. My second time joining in Met Monday. Love love love it. 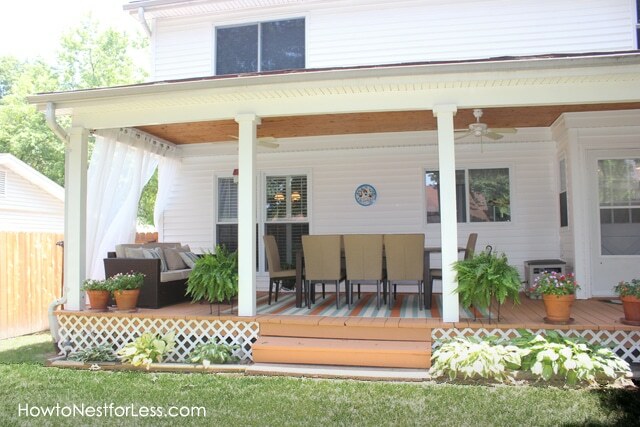 I am a BIG porch/patio person and I absolutely love all your upgrades. The rug definitely looks fantastic. I can’t believe that couch is from Target. Everything looks comfy. Thanks for sharing and I am your newest follower stopping by from Wow Us Wednesday. Oh by the way, the ceiling on the porch is gorgeous too. 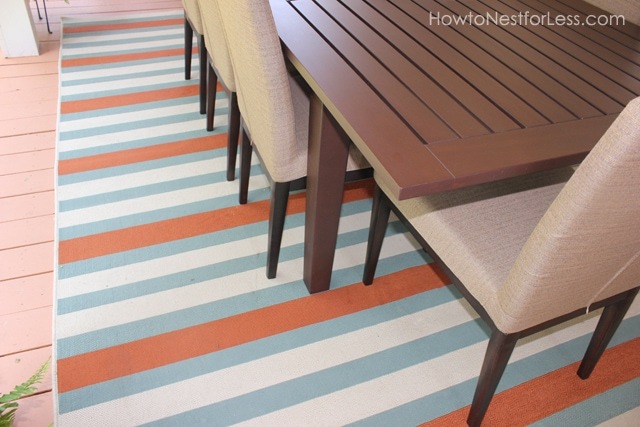 That table is amazing… and I love the colors in the rug! Great space. I love the rug – it really ties the whole space together. I bet that porch is seeing a whole lot more action now. This is soooo beautiful! 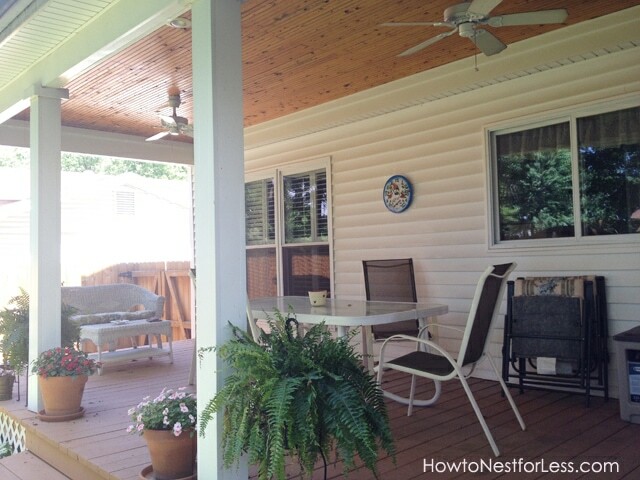 I love the outdoor drapes, they make the porch so cozy! You did such a great job putting all of the wonderful pieces together!!! Beautiful Erin! I can’t believe the couch Is from Target….looks gorgeous!